We love a challenge! Listening to your vision, recognizing your needs and strategically identifying how to present solutions that ultimately exceed your expectations is what drives us daily. Reach out and challenge our dynamic team of event professionals to provide innovative options to enhance your next event in Colorado, Florida and Nevada. No event is too small or too large for our team of experts with more than 412 years of combined diverse industry experience. From Broadway to the White House and everything in between, our team anticipates needs and understands the nuances of events. There’s a different energy when there are live performers at an event. Guests stand up, clap, smile, dance or laugh when they experience it. Our Imprint Group in-house music and entertainment productions have been voted “The Best” for the past 8 years and counting. An event’s success is driven from the look, the sound and the overall feel of the experience provided. Our corporate event planners expertise in staging, lighting, audio and visual services will insure your program has impact and your brand visibility is maximized throughout the experience. The logistical backbone of our destination management company, Imprint Group has been offering DMC services since our inception in 1969. We’ve been honored and recognized on the local, national and international levels for our expertise in creating, planning and executing the most innovative, challenging and diverse programs over the last 49 years. Our comprehensive portfolio of services is designed to meet our partner-client needs. Imprint Group has meetings and event experts in various disciplines to provide the ever-powerful value add to your next project. You will recognize the Imprint Group difference through our high standard of professionalism and service, ensuring a consistent and flawless meeting and event experience, every time. Rely on our creative team to provide graphic and spatial design, concept story boarding, music production and creative strategy. Let us plot and cultivate your vision to create a branded, customized solution. We love logistics. 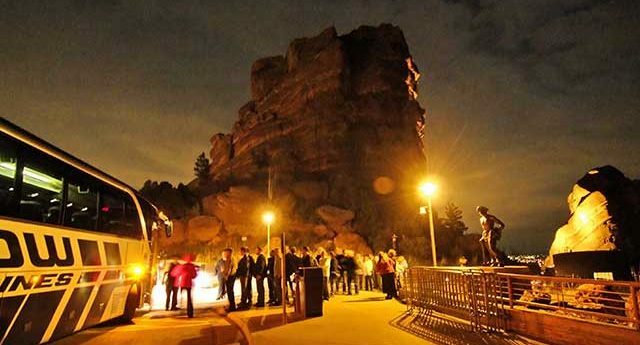 Use our skilled, DMC certified experts to plan and coordinate a customized destination experience for your group from transportation, tours, activities, offsite events and beyond. When it comes to entertainment, Imprint is truly a one-stop service provider. We have a wide array of in-house music and entertainment productions that have been voted “Best of” for 8 years and counting. Relax and let us worry about the details! We take ownership over the success of your event. Use our expertise to help find your venue, select and manage your vendors and execute an incredible experience for your guests. We fully understand the integration of audio visual, logistics, and creative all working together to create your branded experience. Conveying your message effectively provides the ROI required for success. Relationships are important to us, which is why we love creating unique, customized teambuildings for our clients. Our Imprint Group in-house teambuilding programs literally make us part of YOUR team! Rely on our team to provide graphic and spatial design, concept story boarding, music production and creative strategy. Let us cultivate your vision to create a branded, customized solution. We love logistics. Use our DMC certified experts to plan and coordinate a customized destination experience for your group from transportation, tours, activities, offsite events and beyond. When it comes to entertainment, we are a one-stop service provider with a wide array of in-house music and entertainment productions that have been voted “Best of” for 8 years and counting. Relax and let us worry about the details! Use our expertise to help find your venue, select and manage your vendors and execute an incredible experience for your guests. We understand the integration of audio visual, logistics and creative all working together to create your branded experience. Conveying your message effectively provides the ROI required for success. Relationships are important to us, which is why we love creating unique, customized teambuildings for our clients. Our in-house teambuilding programs literally make us part of YOUR team! 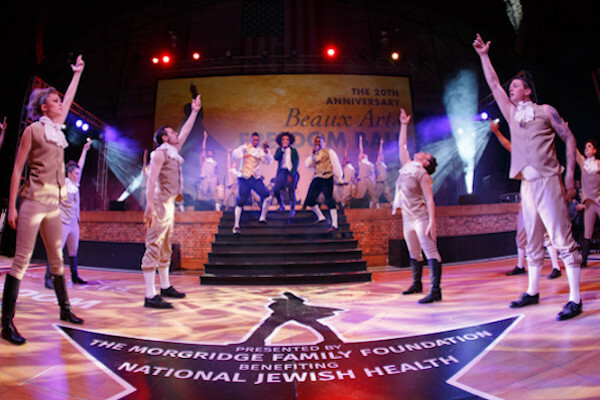 For the 8th consecutive year, National Jewish turned to us to produce the entertainment for their Beaux Arts Ball. 1,200 guests attend this exclusive and highly anticipated fundraising event and they have come to expect a unique and over-the-top entertainment experience. 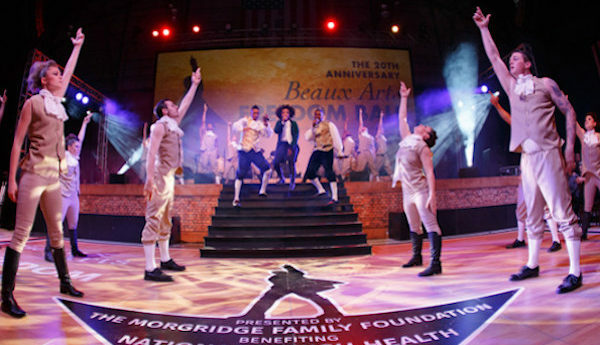 Our company delivered just that for this year’s “Freedom Ball” with a professional cast of 54 dancers, singers and musicians performing a customized production, including original music and choreography, to bring Broadway’s most popular musical, HAMILTON, to life for guests in Colorado. The entire show burst with the youthful and revolutionary energy focusing on America’s path to Freedom! “Destination Imagination” took guests on a trip to four unique destinations, all without leaving their seats! The evening’s journey began in the airport lounge, with a custom song performed by our flight crew. With blindfolds in place, a team of 50 transformed the room to the first destination within two minutes! Much to guests’ surprise, they found themselves in Ireland amidst hues of green, new centerpieces and watching an Irish Step group as staff placed featured drinks and Irish fare in front of them. Three additional courses/transitions featuring Japan, Brazil and Ibiza continued the adventure every time blindfolds where raised! Western Union came to Imprint Group to help them produce their annual kickoff in Orlando. With space being a challenge, the team at WU looked to partner with Imprint Group to come up with the best possible solution to maximize space and ensure to not compromise the key elements of the General Session, multi-day Trade show, Team building activities and Evening Functions. The team at Imprint Group worked closely with both the WU team and the Marriott Grand Lakes team to identify the best “flow” of the event and how best to get attendees from point A to point B, and so on, in the most efficient way without causing confusion and redundancy. Imprint Group created a plan and designed production elements to maximize space while still never compromising WU’s brand and guest expectation. Imprint Group also worked closely with the multiple trade show and exhibit leads at WU to ensure their education seminars were produced properly given the space allocated. Finally, Imprint Group ensured there was a game plan in place to move attendees fluidly through the conference space and each subsequent meeting/event without confusion. The result was a conference that utilized two floors, two separate buildings and two outdoor spaces flawlessly. Imprint Group’s challenge was to provide 3,000 guests staying at multiple hotels with varying agendas and arriving over a three day period. Over six days, averaging nearly 34 motor coaches daily and 76 in one day, Imprint Group moved nearly 3,000 CCA Global attendees in, out and around Denver. With 10 internal groups, Imprint Group kept them in order – transporting them to their destinations safely and efficiently. 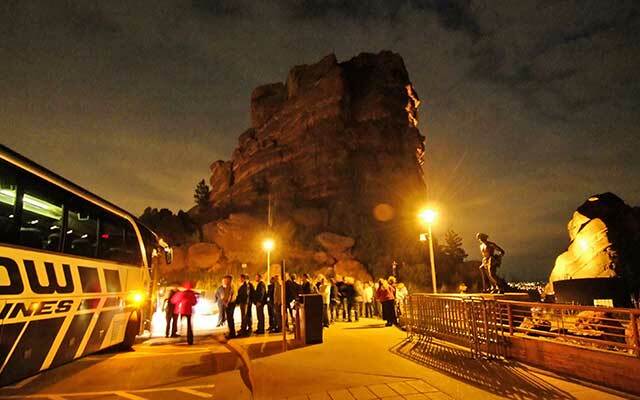 Transportation services included scheduled airport shuttles for all attendees, on-call VIP and ADA vehicles, daily shuttle system, golf and baseball group transfers, numerous industry tours and an off-site event transfer utilizing 55 buses. 6 days. 200 buses. 114 transportation staff. Exceptional execution. Conference for 800 guests with a limited budget and impressed their attendees. IMPRINT was approached by a client hosting a conference for 800 guests with a limited budget who wanted a welcome event that would impress their attendees. 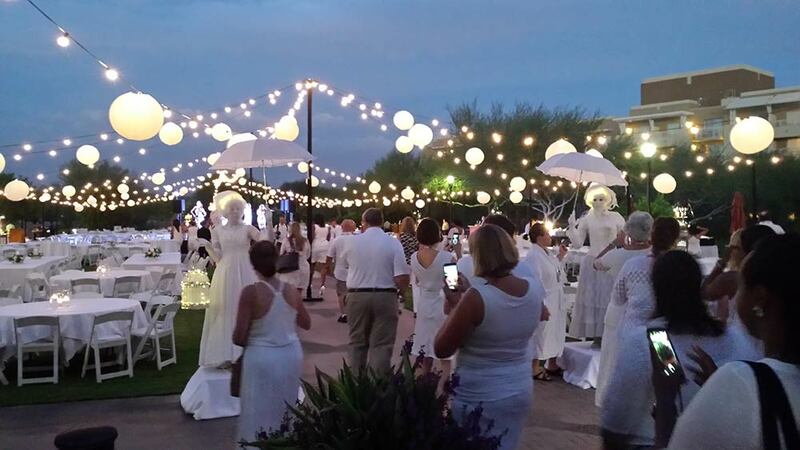 Using the hotel’s existing white linens and rented banquet tables from the conference, our staff suggested the welcome reception turn into a “En Blanc Party,” the famous pop-up dinners that are hosted across the globe and were made famous in Paris. We enhanced the event with market lighting, white lanterns and a variety of reasonable entertainment features, including a living statue and photobooth, making the event feel special despite its reasonable cost to produce. Block party for 650 guests staying at hotels across the city with no budget for transportation. 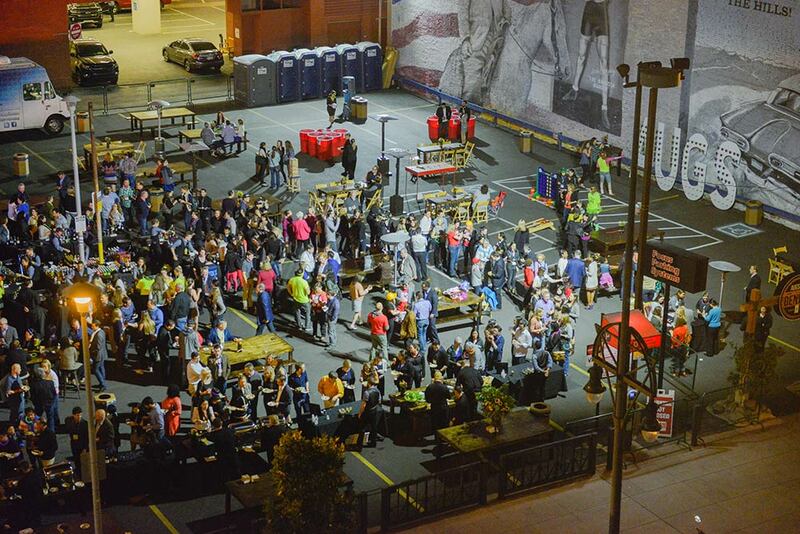 Our association client wanted to host a traditional “block party” for its 650 guests staying at hotels across the city, but had no budget for transportation to an offsite location. We identified an ideal venue – an oversized parking lot located in the center of the city within walking distance from the various hotel group blocks. Additionally, we brought in a variety of food trucks, a portable stage, market lighting and hand-painted murals on temporary walls to create a fun, crowded block party atmosphere. Oversized party games, rustic décor and an interactive DJ to lead an exciting round of karaoke made this event the highest attended in the association’s previous five years of hosting the conference. Provided production & entertainment in 23 cities in the last year. Work hard, play hard… we’ve enjoyed 46 team outings including bubble soccer, dodgeball and happy hours! Our team has 243 hours of continuing education and industry event attendance… and counting! Combined we have 507 years of diverse industry experience. We’re small but mighty, successfully managing 589 total events last year. We have partnered with 28 non-profit and philanthropic clients in the last year. 76.3% of our clients are direct referrals and repeat clients. We have nearly 2,000 talented people that work your events each year.